Accidents happen very easily and this woman is braving the mum-shamers of social media in an effort to save little lives. US mum Arika Hernandez’s three-year-old son was playing on the top bunk bed in his room when he wrapped a blind cord around his neck thinking it would make a nice necklace. Pleased with the results he attempted to climb down from the bunk. Is your child at risk from dangerous lead levels in household tap water? Arika says her poor little boy was struggling to pull the cord away from his neck – to no avail. “He scratched at the cords to loosen them but all he could grab was skin. At the last attempt to get free he jumped to come get us and that very jump saved his life! The cord snapped and freed him!” a very relieved Arika writes. The accident resulted in some very nasty lacerations to the preschooler’s neck. He was rushed to hospital and thankfully these wounds were the only physical injuries sustained. Arika explained that her son was incredibly lucky because these cords are generally very strong and designed not to snap or break easily. She hopes parents will reassess the curtains and blinds in their home, and says that all cords pose a serious safety risk to children. KidSafe Victoria warns that blind and curtain cords can prove fatal for small children. Of course, this statistic doesn’t take in the sort of injuries Arika’s son sustained. In the US the figures are horrendous. 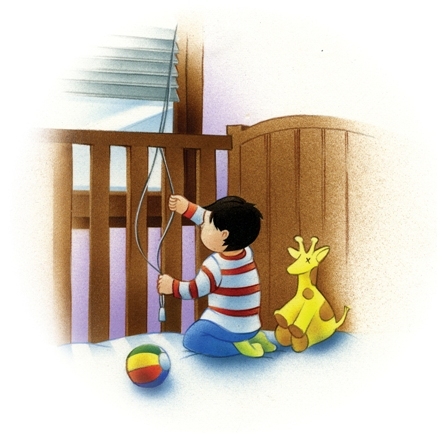 “Nearly 17 000 young children were hurt by window blinds between 1990 and 2015, and though most injuries were minor, almost 300 died, ” AP reports. Check all the rooms in your house for any blinds or curtains with long cords that are either loose or looped. This includes any cords that are within children’s reach at floor level or near furniture they can climb on. Secure any loose or looped cords with cleats or tension devices – these can be purchased from your local curtain and blind retailer or hardware store. Blind Cord Safety Australia also has brilliant advice to help families address the safety of their home’s curtains and blinds. The ACCC also warns that electrical cords positioned near cots and beds can also pose a strangulation risk for small children. We’re so glad this little boy escaped with his life and very thankful that Arika is choosing to share her family’s story – and more details on the safety of blinds.